Great idea for making a perfect gift. Buy the mirror book and receive two free frames to decorate. Welcome! Our online seashells store has been made easy to make shopping for sea shells, craft ideas, sailor valentines and other gifts from your home as simple as possible. We at The Shell Store have put our products and ideas here for you to view, purchase, get ideas, or just enjoy. We have many different departments here. We carry Craft Sea shells, Craft Supplies, Specimen Seashells, Sailor valentine boxes, Wholesale Mirrors and Frames, and many items for decorating your home. Please feel free to print our many catalog pages to make shopping easier. Our seashells list are available online only, we do not print seashell catalogs for mailing. This is our window to the world. Enjoy! The Shell Store has the Lowest Prices, Highest Quality and Best Selection of seashells and Coral in the Area. Seashells have long been a popular decorating item, and during the past few years their popularity has grown rapidly. Everything from seashell planters to beautiful seashell jewelry, have made sea shells part of our everyday existence. More and more, decorators and designers are using natural products and materials to increase the warmth and beauty of their creations. 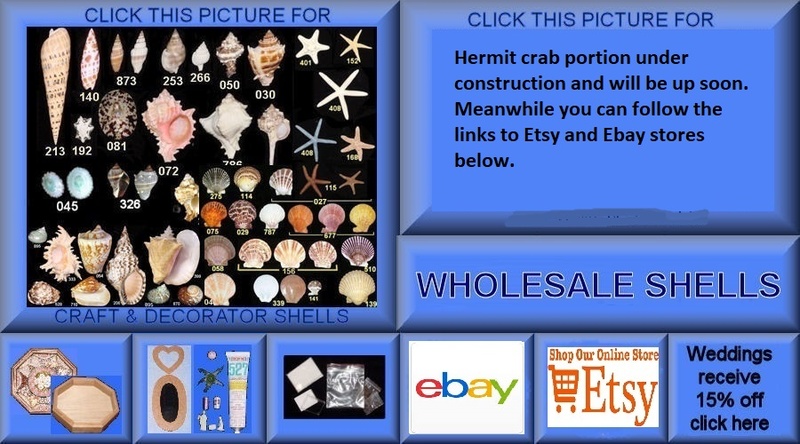 Please browse through for our site for the wonderful sea shells craft ideas. At THE SHELL STORE, shells are our business and our pleasure. We also specialize in coral at very reasonable prices. We clean many of our seashells and corals. Our high standards of cleaning can be seen throughout the store. This enables us to give you top quality seashells at the lowest prices. So, whether you are looking for a beautiful seashell specimen, a home decoration or the supplies to do-your-own thing, we know you will enjoy THE SHELL STORE!! !